Todd Hoak’s drawing assemblages are created from other drawings cut apart and reorganized to create a “Frankenstein Cubist” view. 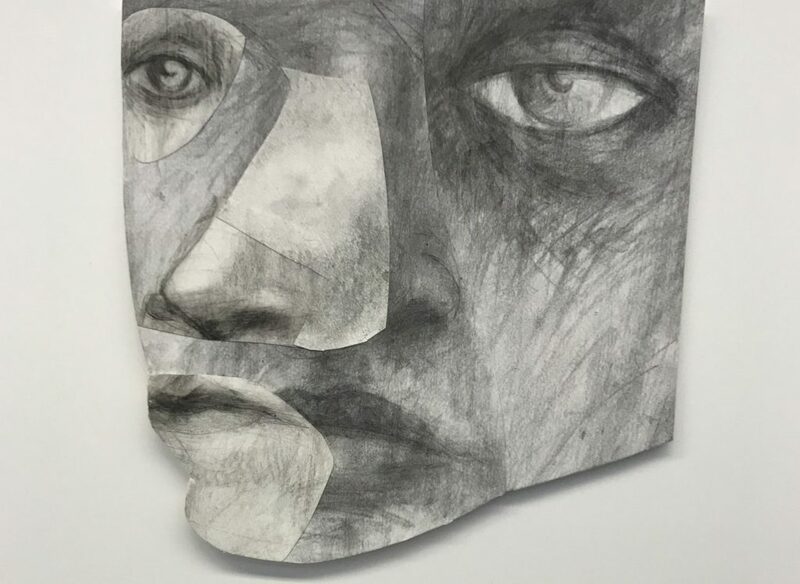 Duplicated facial features give the viewer a sense of unease and at the same time, the inability to look away. He draws with graphite on paper and a scroll saw blade on patinated wood panels. This sensitive and beautiful body of work will be on display at Heights Arts in Cleveland Heights. “In first grade I sculpted a head of Richard Nixon from self hardening clay, my mother kept it until she passed away. In third grade, I drew the best Jesus in my class, received critical acclaim from my classmates, Sister Colette wasn’t sold. It always starts with the same way, usually a portrait in the form of sketches, drawings, paintings from memory with the occasional glimpse at an ear, a nose or an eye from life, from a photograph or from a film. Then boredom sets in, restlessness, followed by the inability to just leave it alone. Then comes the erasure, the cutting, more erasure, layering, gluing, more cutting, erasure…seemingly endless editing which often leads to a mess but occasionally is something worth keeping.